A vegetable gratin is my absolute top winter side dish. There are so many root vegetables to combine for a rich treat during cold weather. A gratin is, as my mother used to say, a very “forgiving” dish and it’s hard to go wrong making one. This parsnip and carrot gratin was adapted from a carrot and cheddar gratin featured in a recent issue of “Fine Cooking”, one of my favorite food and cooking magazines. First, I wanted to cut the size of their recipe down to serve only two-three people. I took their suggestion of substituting parsnips for half of the carrots. Next, I played with the cooking times and some of the proportions of the other ingredients. After some thought, I sliced the parsnips into thinner pieces than the carrots, since I imagined that they would take longer to become tender than would the carrots. I served this with some grilled chicken, but, as always, a vegetable gratin makes a nice vegetarian entrée. TIP: The gratin can be assembled earlier in the day, refrigerated and then baked just before serving. You might add 5 minutes to the cooking time if it is going straight from the fridge to the oven. Butter a medium-sized gratin dish, or any shallow-sided baking dish. Heat the oil in a medium-sized skillet, add the onion and cook over medium heat until onions are golden-brown, about 10 minutes. Using a small bowl, combine the melted butter, parsley and thyme. Add the panko. Mix well. Set aside. Whisk the cream, mustard, salt and pepper into the onions. Add the parsnips and carrots. Bring to a boil, reduce heat to low and cook, covered, until vegetables are just beginning to feel tender to a fork. Pour into buttered gratin dish. Top with cheddar, then panko-herb mixture. Bake until vegetables are tender and crust is golden brown, about 25 minutes. Loved the photo… warm and inviting! Thanks, Sally – my husband decided last night it is his favorite of all the gratins I make during the cold months here. Now, THAT’s some endorsement! 🙂 I better get to this recipe sooner rather than later…. I don’t think you will be disappointed – let me know? This sounds great! its nice to see a different way to prepare parsnips, I never think to make a gratin with vegetables, thanks for the idea! I hope you try it, Jayne – I’m using less cream and more milk next time. I love Fine Cooking magazine too!! And love gratins. They do indeed make a great vegetarian entree since I can just add some grains or legumes to it. It’s such a wonderful meal in the fall and winter. Susan, you were the one who taught me about “Fine Cooking” – thanks! My Mom adores parsnips and would often add them to soups and stews. She doesn’t cook anymore and would love a dish of the fabulous gratin! 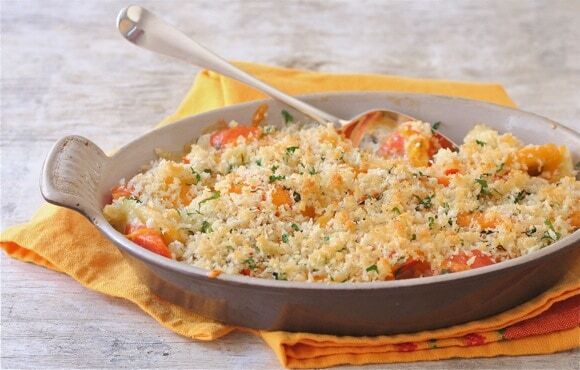 I love gratins and root vegetables – this is perfect. Would like to pair this with one of your super braises. Well I must admit, it’s possible I’ve never made one! I love the idea of carrots and parsnips as well as the color. I will give it a try! That was like me and frittatas until brunch here last weekend. Liz this photo is gorgeous! I love the light. This looks like a great recipe and a fun way to get veggies on the table. Thanks, Lisa – not exactly on my diet but will work with 2% milk as well. Love root veggies. Wonderful way to serve winter vegetables. 🙂 I’d like to make a version of this for next Wednesday’s dinner. I live for forgiving dishes. Thanks for another great one, Liz!